Multidisciplinary consultancy offering town planning, urban design, landscape architect and aborist services. Offices in Dublin, Cork & Galway. CSR have lodged planning applications for three new wind farms in 2014 (two in Wales and one in England) on behalf of Njord Energy. The wind farms range from five to seven turbines and if granted will provide up to between 12.5MW and 17.5MW of electricity to the UK national grid. The turbines range from 100m – 110m tip height. In association with Cunnane Town Planning (CTP), CSR led the EIA multi-disciplinary team and co-ordinated and produced the Environmental Statement (ES) to accompany the planning applications for the respective schemes. This included the screening and scoping exercises prior to the EIA and the co-ordination of the requisite surveys and assessments as part of the process. CSR critically reviewed all supporting documents and assessments and incorporated the various inputs into a single document consisting of four volumes. CSR also prepared the supporting Planning Statement and Design & Access statements that accompanied the applications. CSR and CTP are currently in discussions with the respective Local Authorities, including statutory and non-statutory consultees to gain full planning permission for the developments before the end of 2014. CSR, together with input from other consultants are also addressing concerns raised by third parties. In addition, CSR are co-ordinating the preparation of a planning application (including EIA) for a fourth wind farm for Njord Energy in Powys in central Wales. This scheme is for six wind turbines with a capacity of up to 15MW. This application will be lodged by the end of August 2014. Cunnane Stratton Reynolds were recently involved in an application to introduce a new retail format to Ireland. U-Fix Express sought planning permission for the amalgamation of two retail units in Artane for their new hardware store, which is based on the Pick and Brick model. The Pick and Brick model is a new format for hardware stores which has proven very successful in Europe. It is broadly similar to the format employed by Argos. Rather than requiring a large floor area for the display of products, the shops products are displayed in catalogues or online. Customers come to the shop, and order what they require. Small items are kept in stock and sold over the counter. Larger items such as cement, timber, bricks etc. are stored in a centralised depot and are delivered to the customer’s home. The benefits to both the retailer and the customer are clear. The retailer can provide a large range of products but in a much smaller unit than would normally be required. This reduces overheads and allows them to locate closer to the customer base rather than in large retail parks on the edge of towns and cities. For customers it means access to a wider range of hardware products in their local hardware store, without the need to travel potentially long distances to the large hardware stores in the retail parks. The result in terms of planning is more sustainable form of retail development and travel patterns. Cunnane Stratton Reynolds (CSR) have assisted Great Northern Distillery in obtaining a Section 5 Certificate of Exception for the proposed conversion of the former Harp Brewery in Dundalk into a new distillery. The works will have no impact on a protected structure. CSR prepared a planning statement which demonstrated that due to the significant overlap in methods of production, a brewery and distillery could be considered under the same class of use and therefore there was no material change of use. CSR with the assistance of Scott Cawley and Mulroy Environmental prepared a EIS Screening Report, and appointed Scott Cawley to prepare an AA Scoping Report. Both reports demonstrated that there was no requirement for either a full EIS or AA. Cunnane Stratton Reynolds (CSR) has recently been involved in obtaining planning permission for an exciting and innovative micro craft distillery and visitor centre in the Liberties, Dublin. 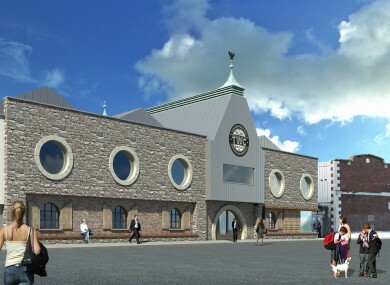 The development is the first new distillery in Dublin in over 125 years, and will reintroduce the distilling of traditional Irish pot still whiskey, to its ‘spiritual home’ in Dublin’s inner city. CSR were appointed by the Teeling Whiskey Company to oversee and manage the planning application, and to advise on planning policy. CSR advised the client to lodge one application for distillery and visitor centre instead of splitting the two elements as originally envisaged by the Teeling Whiskey Company presenting a stronger planning and regenerative case to the Dublin City Council and saving both time and money for the client. Extensive work was undertaken by CSR to clarify the zoning, the planning status of the site, and the acceptability of the proposed use on that zoning given the scheme’s regenerative potential in the inner city. The planning application, under the supervision of CSR, was lodged at the end of September and planning permission granted in December 2013. CSR are proud to have been involved in this first if its kind in Dublin for over a century. entrance lawn area outside the Museum and the creation of a new café garden along the River Lee. Cork City Council. 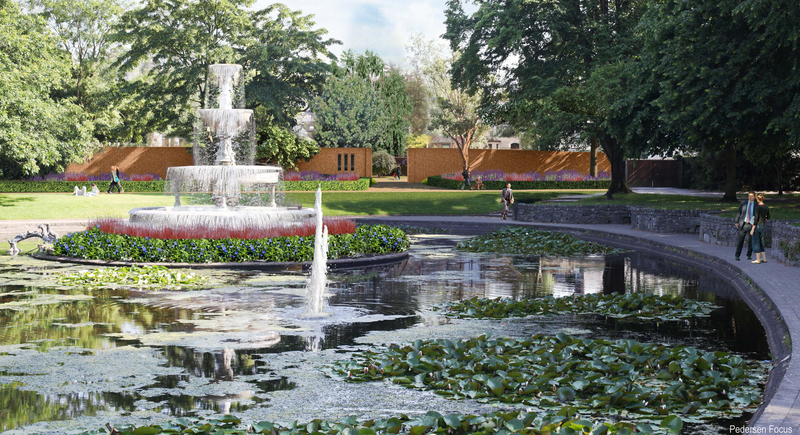 The aim of the project is to enhance the role of the historic Mardyke Gardens as a iconic visitor attraction through the creation of new contemporary gardens, an extensive new performance area and enhancement of older features and areas within the park, (right). 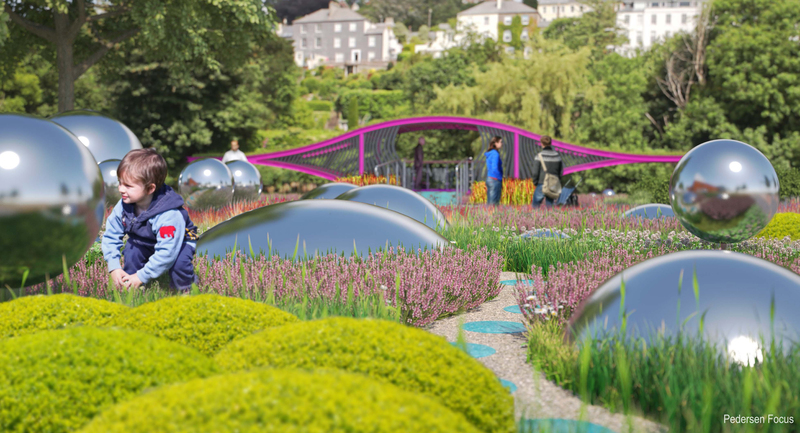 In recognition of the park’s history as the venue for the 1902 Cork International Exhibition (left), our design team re-imagined the gardens as a venue and destination fit for the 21st century. 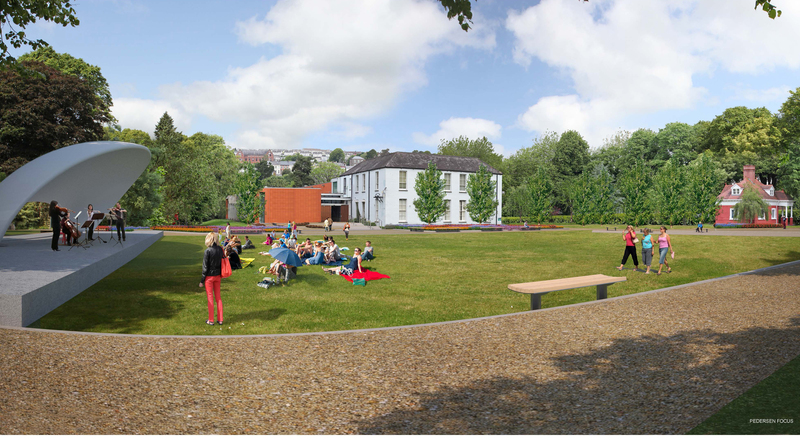 The team designed spaces that could cater for large outdoor public events and performances as well as smaller garden spaces of exceptional design quality, reaffirming Mardyke Garden’s place within the city as a venue and setting for public celebrations, exhibitions and spectacles. Already the existing listed fountain (above), within the park has been restored. The entrance lawn (above), with its new pavilion and the new café garden (below), are under construction. 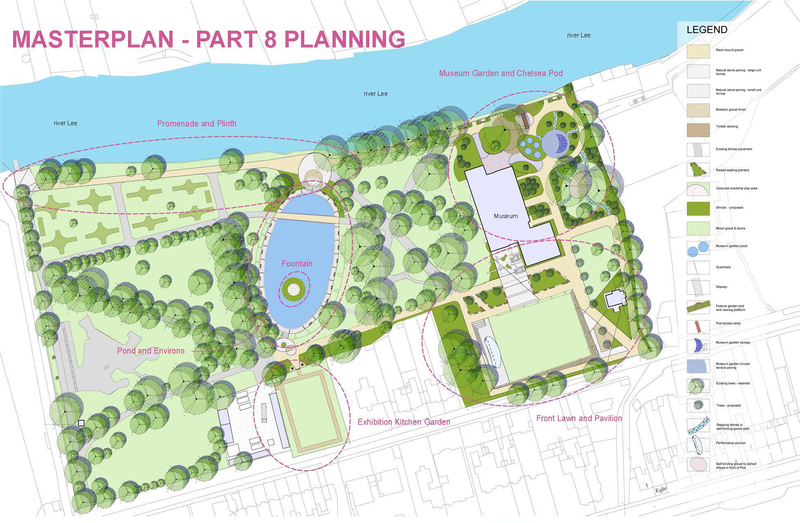 Potential future phases will see restoration of the existing pond including the creation of new focal points at its southern and northern extremities, upgrading of the riverside promenade and re–furbishment of the walled garden. 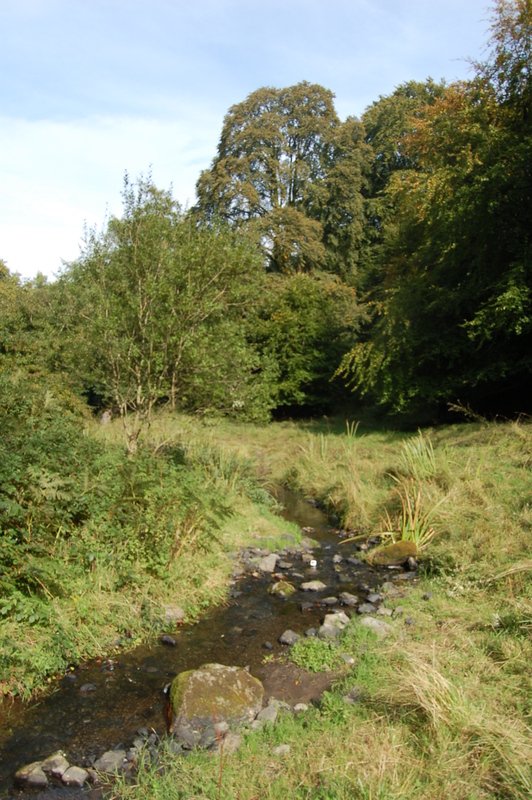 Cunnane Stratton Reynolds (CSR) has been appointed along with Roughan & O’Donovan engineers and Tourism Development International to investigate the feasibility and, identify route and design options for a Slade Valley Heritage Trail in South County Dublin. It is envisioned that the trail would provide a multi-purpose recreation facility for local residents, accessing the rich natural and cultural heritage of the valley and reinforcing the historic links between the three communities of Brittas, Saggart and Rathcoole. The trail would also be intended to attract visitors to the area for the benefit of local businesses. The Slade Heritage Trail Steering Group is made up of representatives of the three communities, along with South Dublin County Council, represented by the Heritage Officer Rosaleen Dwyer. Work on the project has commenced and it is intended to complete the study by the end of 2013. The same consultant team led by CSR is in the final stage of a similar Heritage Trail planning study for the Nore River Valley in Co. Kilkenny. Cunnane Stratton Reynolds has successfully achieved a reduction of over 60% in the development contributions for a small business from Dublin City Council. Our client wished to convert part of their house to a commercial use, and had obtained planning permission in 2011 to do so at a prohibitively expensive cost. They had been levied nearly €20,000 in development contributions rendering the scheme unviable. CSR has obtained a grant of permission for the change of use with a development contribution reduced to €7,300.